Learn more about small business loans for veterans along with info on VA loan providers, and frequently asked questions. Small business loans for veterans refer to business funding given to veterans, active service members and their spouses or widows, to help them start or grow a small business. Below, we take a look at the various VA loans available, and how to qualify for a small business loan. VA business loans comprise three Small Business Administration (SBA) loans, namely: the SBA 7(a) Program, SBA Express Loans, and Military Reservist Economic Injury Disaster (MREIDL) loans. MREIDL loans are provided to businesses to cover the financial cost of an employee who has been recruited for military service and is no longer able to contribute to the business while they are away. SBA loans for veterans are guaranteed up to a certain amount and there is no upfront fee for those who qualify for loans up to $350,000. VA loan rates range from 4.0% to 6.5%, depending on the loan amount. Veterans, including active service members, former members, service-disabled veterans, and their spouses or widows, and those in the Reserve or National Guard are eligible to apply for small business loans for veterans. According to the SBA, a veteran or their spouse/widow must own at least 51% of an existing business to qualify. Veterans who wish to open a business are not required to have a minimum credit score, however, most VA lenders do impose a personal credit score of at least 620 to qualify for a VA loan. For more information on how to qualify for a small business loan through the SBA, visit sba.gov. SBA 7(a) Business Development Program. What can business loans for veterans be used for? SBA loans for veterans can be used to cover working capital, hiring employees, purchasing equipment, real estate, and machinery, etc., expanding an existing business, and covering construction or renovation costs. Are there small business loans for veterans with bad credit? Yes, there are several lenders who provide start-up business loans to veterans with personal credit scores of less than 600. A few good options are QuarterlySpot, BlueVine, Kabbage, Ondeck, and FundBox. Is there a disabled veteran small business loan? Yes, disabled veterans can apply to the SBA 8(a) Service-Disabled Veteran-Owned Business Contracting Program. 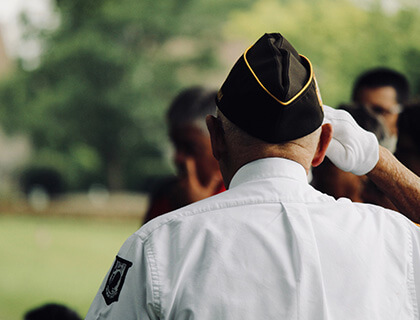 To qualify, you need to have a veteran-owned business (with 51% ownership) and have one or more service-disabled veterans managing the day-to-day operations of the business. If you're interested in applying for a grant, be sure to read our article on Small Business Grants for Veterans.